So what are little Quick Kicks made of? This City Strike martial artist uses the head from a 25th Anniversary figure with, for the most part, elements from existing Storm Shadow action figures. The costume itself is sort of an inverse Bruce Lee as seen in Game of Death, which is what Uma Thurman copped in Kill Bill. While the nod is nice, it'd have been way cooler for him to actually be wearing the yellow suit. But hey, let's not dwell on what isn't-- this is a nice toy! It's not often that a G.I. 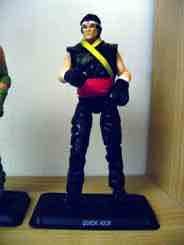 Joe figure wears sneakers, but Quick Kick does. His fists have optional "training gloves" which look pretty swell, and the accessories, while nice, are generally not the most exciting thing. 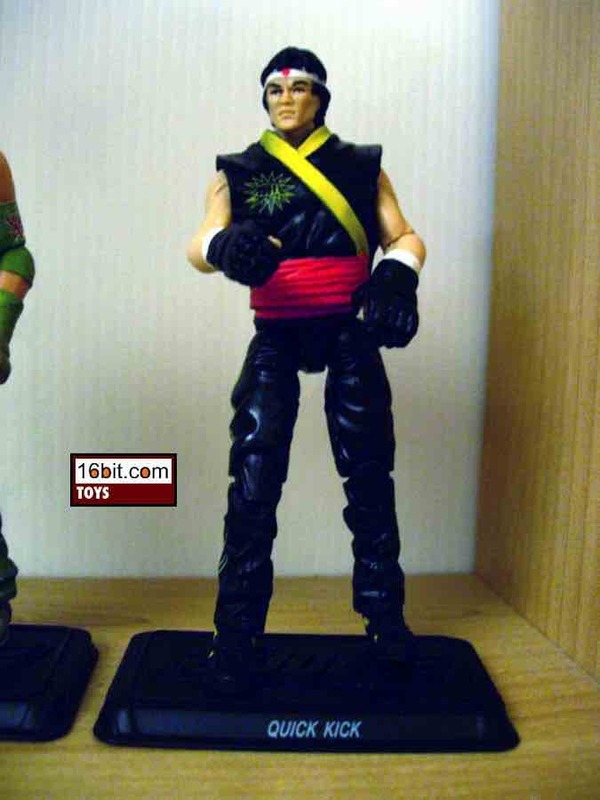 You're going to want to pose this figure as some sort of kick-puncher or punch-kicker, things like a sword or a machine gun take away from any and all kung fu fighting you might want him to do. (And you will want him to do this fighting.) Oh, and for you trivia fans, the gloves actually come from the same Duke figure from which Spirit Iron-Knife's torso originated. As of today-- we went out and checked-- some of our local Toys "R" Us stores are seemingly getting new shipments of this figure and Spirit Iron-Knife. I suggest you go buy them if you find them.